A light cotton baby blanket is perfect for a summer baby. 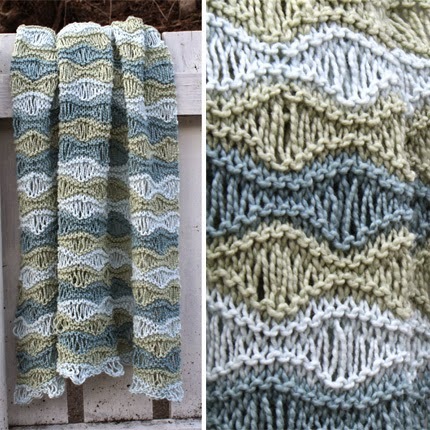 This one is knitted in a light version of the sea foam pattern, wich makes it airy, stretchy and perfect for wrapping your baby. The blanket is knitted in Pickles Organic Cotton DK, wich is perfect for this tecnique, as it is spun from one thick and one very tin ply. Where other yarns would split in the loosely knitted parts, this yarn holds itself together and make the waves look fantastic!